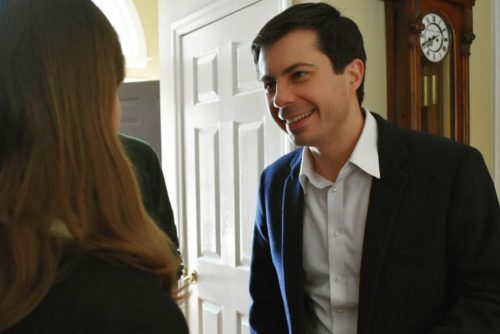 South Bend Mayor and Democratic presidential candidate Pete Buttigieg has shot up to third place in a recent poll. 11% of likely Democratic caucusgoers in Iowa said that they would pick Buttigieg as the 2020 Democratic presidential nominee in a recent Emerson Poll. 25% backed former Vice President Joe Biden, who has not yet declared his candidacy, and 24% said they would support Senator Bernie Sanders (I-VT). 10% backed Senator Kamala Harris (D-CA). Buttigieg got 0% support in the same poll in January. “The biggest surprise in this poll is Mayor Pete, last week we saw him inching up in our national poll, and now he’s in double digits in Iowa, America is going to be asking who is ‘Mayor Pete’?” Emerson Poll director Spencer Kimball told The Hill. In national polls, though, Buttigieg is placing much lower. A recent Fox News poll put him in seventh place with 1% of respondents supporting him, behind Biden (31%), Sanders (23%), Harris (8%), former Representative Beto O’Rourke (D-TX) (8%), Senator Elizabeth Warren (D-MA) (4%), and Senator Corry Booker (D-NJ) (4%).